26.08.2014. Wine traders from around the globe descended on Georgia to attend the yearly conference of World Wine Trade Group (WWTG). Georigan Minister of Agriculture Otar Danelia opened a plenary meeting of the WWTG at the Radisson Blu hotel today. The session was chaired by Deputy Minister of Agriculture Nodar kereselidze. 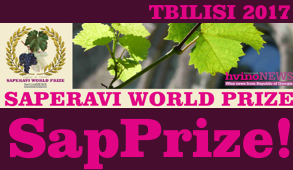 The two-day event is being held in Tbilisi and will see experts in the wine industry discuss global issues related to wine trading. 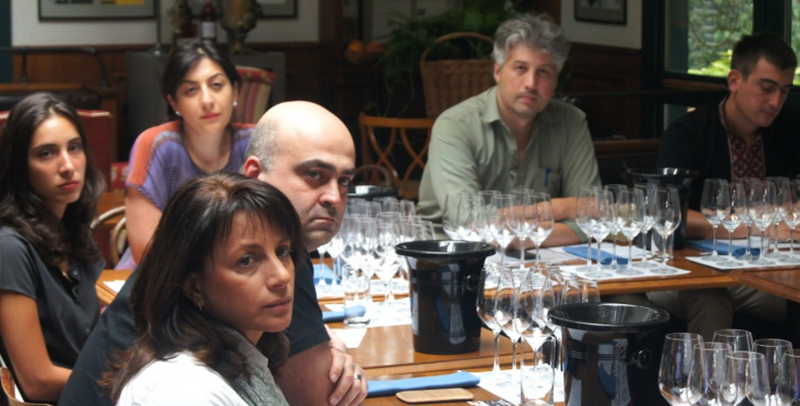 On August 27, conference participants will travel to Kakheti and explore the various wineries in the region. 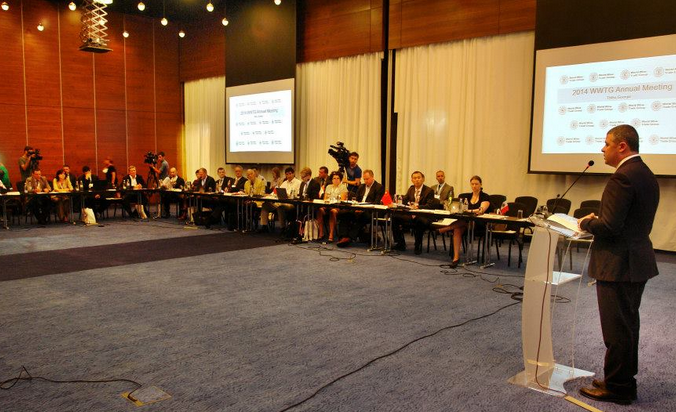 "Today’s meeting is a very important event – Georgia is hosting the yearly meeting of the WWTG. 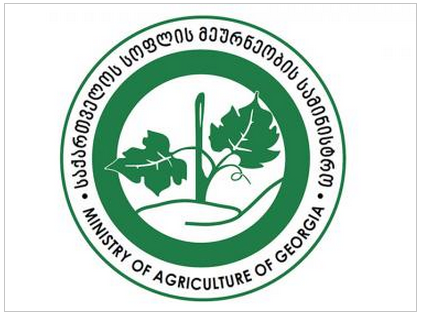 Members of the group are leading countries in wine trading – USA, Canada and China to which Georgia has the will of expending its export market,” Agricultural Minister Danelia noted. 22.08.2014. One of us leads a neighborhood group in a monthly wine tasting and it's always fun to find new and different wines to try on a cozy group of eager oenophiles. Here, he can watch what wines have broad appeal and which get the silent treatment. At the end of the night, the preference is evident in how much is left in the bottles. 21.08.2014 (Hvino News). We have prepared the summary of Georgian wine export statistical data for 6 months in a graphic form. 20.08.2014. As summer draws to an end the country’s grape harvest season is just beginning with experts estimating 126,000 tonnes of grapes this year will be picked. Despite the current hot, sunny skies, weather problems earlier in the year negatively affected crops so this year’s yield is expected to be 15 percent less than 2013. A coordination centre for grape vintage under the supervision of the government, Rtveli 2014 said up to 110,000 tonnes of grapes would be purchased by wine producing companies this season. The remaining 16,000 tonnes will be produced by local farmers. Since the harvest is about to kick off the Ministry of Agriculture believed farmers will not have problems selling their produce this year. One of the reasons the country purchased more grapes this year was because of expansion into new markets including Russia. But wine producing companies said they had reached success in other markets too, like China. 18.08.2014. Wine tourism in Georgia would flourish if the government’s one of the top priorities is to restore and administer those historic and architectural monuments, where traditional Georgian maranis are preserved. At the same time, additional research has to be done in order to designate hundreds of national buildings as historic-cultural monuments. Unfortunately, these valuable historic resources are ignored nowadays and many unique buildings are being destroyed right before our eyes. 10.08.2014. On August 7, an evening of Georgian wine was held in Berlin, at the Museum of European Cultures and hosted by Malkhaz Kharbedia, the President of the Wine Club. The event was part of the Georgian Culture Days festival that started on July 31 and will last till August 30. The Georgian Culture Days have been organized by the Georgian Embassy in Germany and supported by Georgian National Wine Agency. In the beginning of the evening, Malkhaz Kharbedia gave a brief presentation about Georgian wine that summed up the history of viniculture and explored Georgia’s Protected Designations of Origin in the end. The presenter touched upon the earliest traces of winemaking and viticulture found on the territory of Georgia, which had led the country to acquire the title of “The Cradle of Wine.” He also talked about the wine producing regions of Georgia, the current state of Georgian viniculture and more importantly, about the traditional method of qvevri winemaking, the topic, which Malkhaz Kharbedia discussed closely during his speech. 15.08.2014. 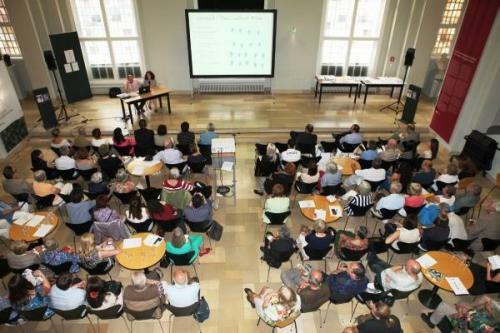 The European Heritage Days in 2014 is dedicated to the love of life. 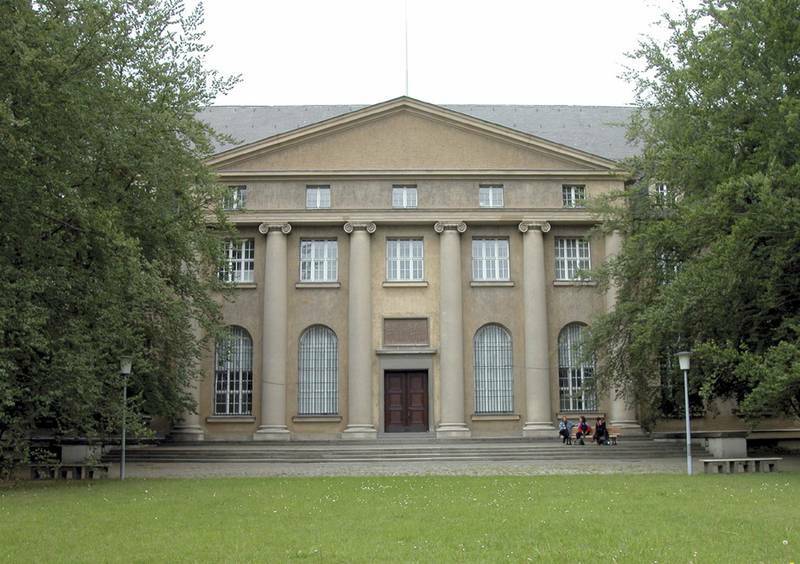 To mark this occasion, the Museum of European Cultures in Berlin devotes its space to Georgian culture. 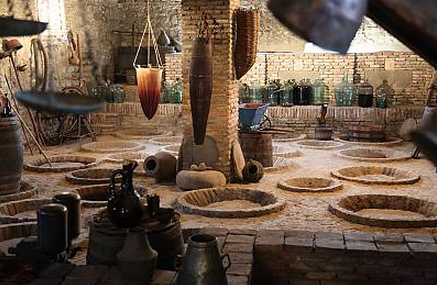 From July 31 until October 5 the museum is presenting an exhibition “Wine – Culture” and degustation of Georgian wine and cuisine. The Museum organizes similar events since 2000, and it has already hosted days of Polish, Venetian, Tatar, Estonian, Croatian, Romanian, Sardinian and Slovak cultures. Along with the Georgian Ministry of Culture, the event is also supported by Prussian Cultural Heritage Foundation; Embassy of Georgia in Berlin; The National Museum of Georgia in Tbilisi; The Museum of European Cultures in Berlin; Supreme Council of Adjara; The National Film Center; and National Wine Agency. The presentation of Georgian wine culture shows up that eating and drinking are not only a necessity but often a cause for celebration. And the dining culture is an important component of social life. The exhibition displays photographs by one of Georgia’s famous photographers. Dimitry Ermakov (1846 -1916), illustrating the wine-making process in the 19th and early 20th centuries. 08.08.2014 (Hvino News). 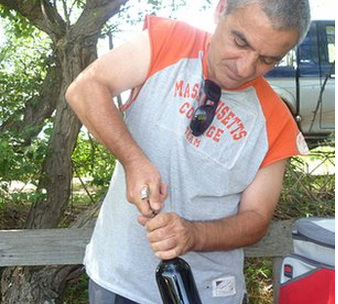 Is it possible to use wine instead of money in a business-to-business transaction? Hvino.com - Georgia's primary international wine business portal - says "Yes!" 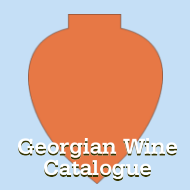 With its PAY BY WINE Special Offer the Georgian winemakers can actually pay by their products for Hvino's promotion services, such as banner advertising. 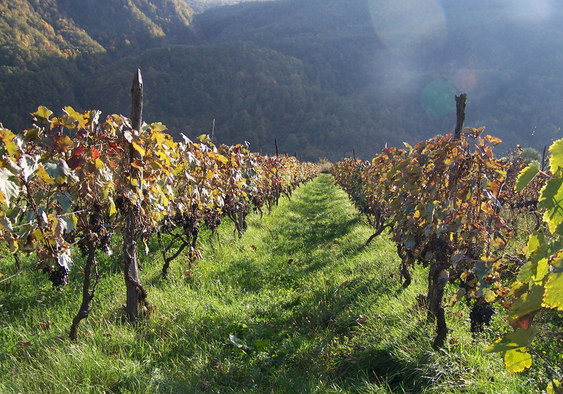 This unique and innovative offer was conceived by Hvino's marketing team especially for the smaller companies and individual winemakers, to make it easier and more affordable for them to promote their products internationally. The offer is, however, open to wine producers or wine traders of any size. 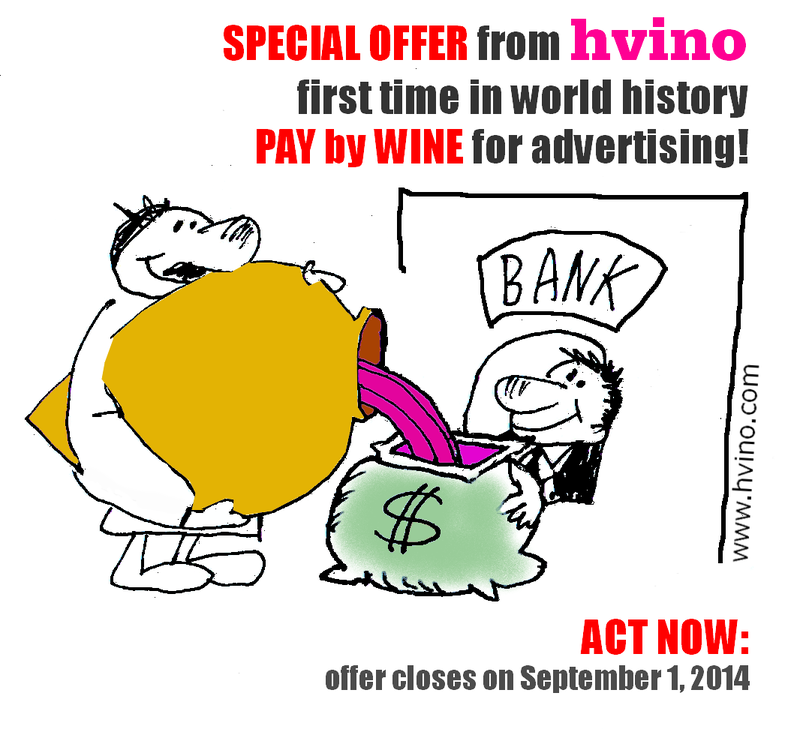 For the first time in world history, web promotion is offered for wine! Inge Olsson, manager at from Hvino.com, explained: "It's that simple: you choose the type of banner you want (banners are here); we make a usual invoice, but you do not pay. Instead, you deliver your wine! Price of your wine is based on average shop's retail price, and the sum is equal to invoice". Winemakers make big savings, because their winemaker's wholesale price is lower than retail price.The offer is very profitable for winemakers, as they actually receive up to 60% discount from Hvino's standard advertising rates. 07.08.2014 (Hvino News). According to the National Wine Agency of Georgia total of 31 376 279 (0,75L) bottles of wine were exported to 35 countries as of July, being 95% higher vs last year same period. Five leading export destinations of Georgian wine are as follows: Russia, Ukraine, Kazakhstan, Poland and Belarus, where Russia holds 65% of total volume of exports. Exports in value as of July 2014 amounted to US$ 102,186,500 which is 117% higher vs last year same period. 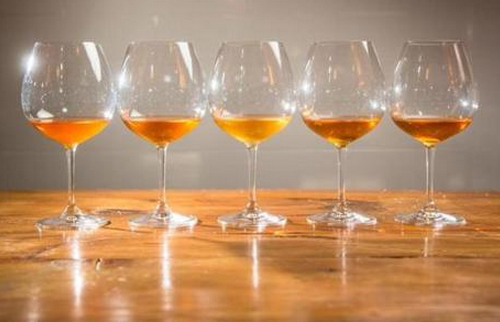 Besides, as of July 2014 in 12 countries 6 455 295 (0,5L) bottles brandy were exported. In value, the brandy exports amounted to US$ 22,973,604 as of July 2014, being 66% up as compared to the same period of previous year. The Ukraine is leading Georgian brandy exports with 3 341 904 (0,5L) bottles as of July 2014, whereas Russia as second with 2 636 904 (0,5L) bottles the same period. 07.08.2014. Export of Georgian wine is on the rise with 65.3% of over 31.3 million 0.75-liter bottles exported in the first seven months of 2014 going to Russia, according to the National Wine Agency of Georgia (NWA). 31,376,279 bottles, exported in January-July 2014, represent 95% increase compared to the same period of last year. 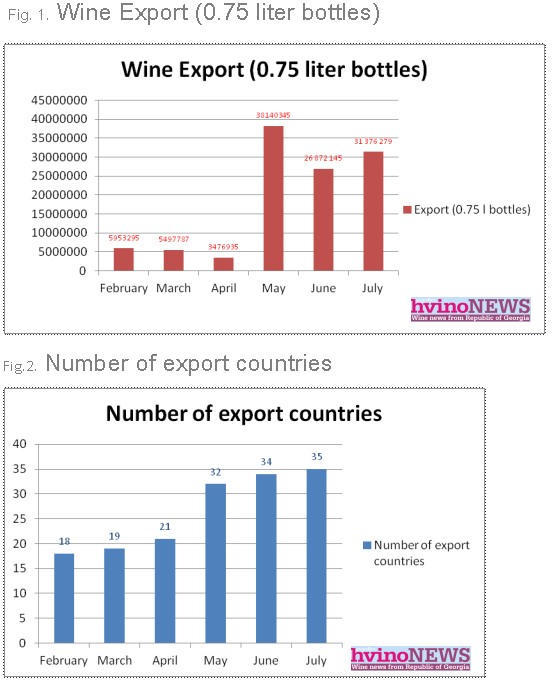 Wine export value increased 117% year-on-year in the first seven months of this year to USD 102.18 million, according to NWA. Ukraine, which was the largest market of exported Georgian wine before being replaced by Russia after the latter lifted embargo last year, is now second, followed by Kazakhstan, Poland, Belarus, China, Latvia, Lithuania, Estonia and Azerbaijan. Georgian winemakers say that Russia’s intention to suspend free trade agreement with Georgia will increase price of Georgian wine exported to Russia by about 20%, which will most likely cause decline in sales, but executives from wine producing companies say it is now difficult to predict a precise impact. 06.08.2014 (Hvino News). 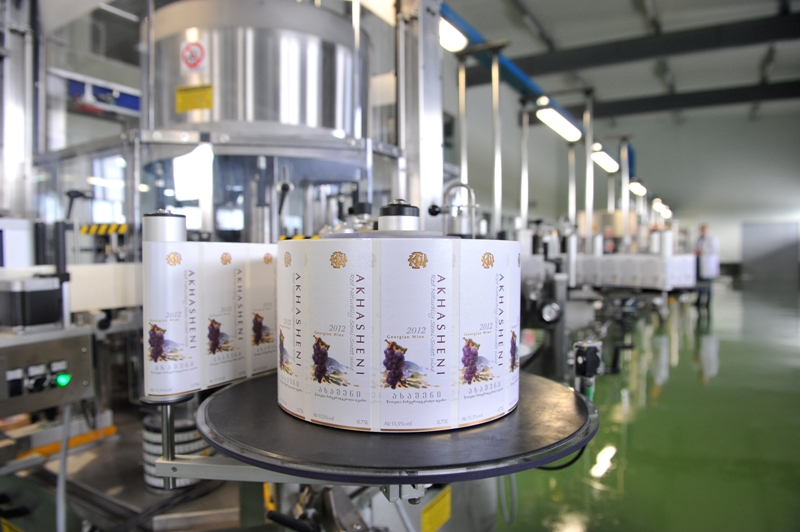 A wine producing company participating in the government's “Preferential Agro Credit Project” starts to bottle qvevri wine. Shalauri Wine Cellar Ltd took a loan of USD 270,000 in the framework of the “Preferential Agro Credit Project”. The company is located in the village of Shalauri, Telavi district, Kakheti region. Director of Shalauri Wine Cellar David Buadze says that the company will bottle qvevri wine for export for the first time. He notes that at this stage Italy, France, Slovenia and other European countries are in the export list. 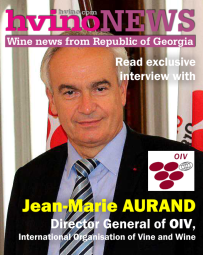 According to Mr. Buadze, the Chinese market is not considered at this stage, because it is unknown how China will take qvevri wine. To do this, the market should be studied first. 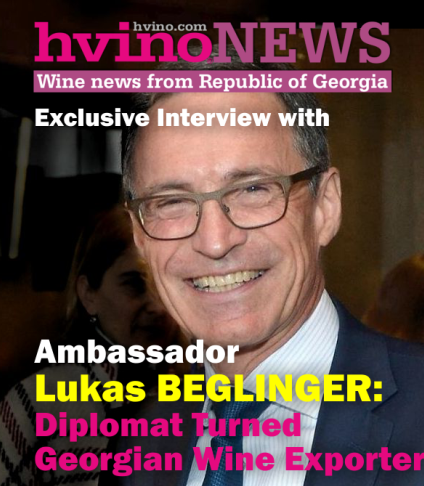 "In Europe Georgian wine enjoys far greater success," - says Buadze. In his words, this year the company was able to produce 15 000 bottles, next year this figure will amount to about 25 000 bottles. The main objective of “Preferential Agro Credit Project” is to offer cheaper access to credit resources to peasants, farmers and entrepreneurs involved in the agriculture industry. 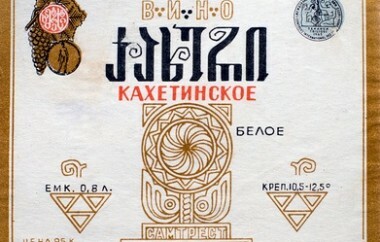 As part of the festival, an evening will be devoted to Georgian wine on August 7 (18:00) and hosted by Malkhaz Kharbedia, the President of Wine Club. 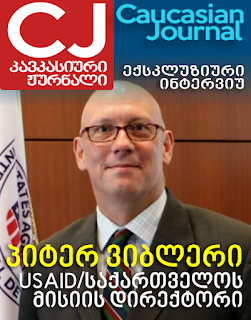 He will be talking about the history of Georgian wine, the traditional methods of qvevri winemaking, the current state of Georgian viniculture and other topics. The presentation will be followed by a tasting event as the guests will sample and describe 10 Georgian wines of different styles. The movie by Merab Kokochashvili – “The cradle of wine,” will close the evening program. 05.08.2014. 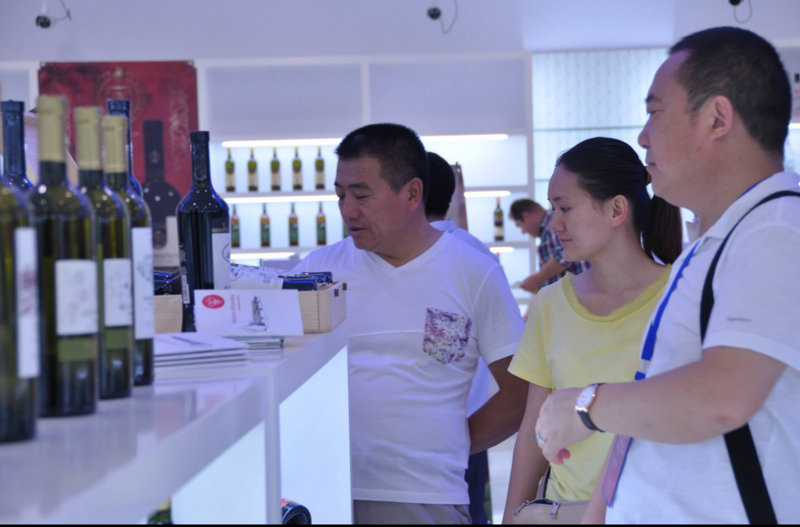 Chinese wine enthusiasts had a chance to taste Georgian wine at one of China’s leading wine exhibitions. More than a dozen Georgina wine companies showcased their local creations at the 2014 Beijing (Yanqing) International Wine Exposition, held in the capital of China from July 29 to 31. Among the 16 wine companies on display were well-known Georgian wine makers Teliani Valley, Kindzmarauli Corporation, Winery Khareba, Shumi and Qimerioni. The exhibition allowed participants the opportunity to meet potential business partners among China’s top wine importers. Exhibitors were also taken on a guided tour of some wine retail outlets and givent he chance to showcase their products at every outing. 01.08.2014. A top Georgian official on Thursday said Russia's possible cancellation of a decades-long free-trade agreement between the two countries came as no surprise and in the end "will not be a tragedy," (see also here). 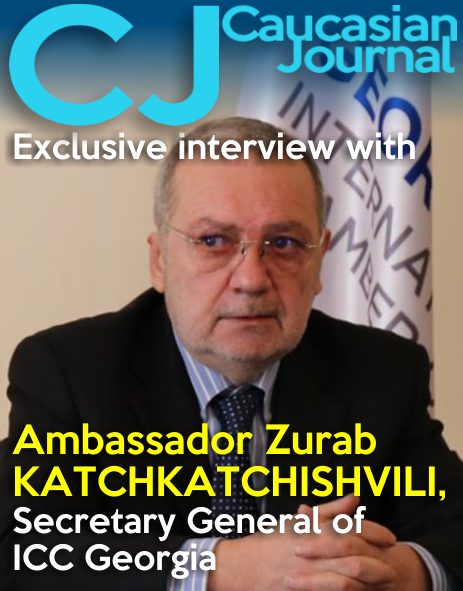 "Naturally, when Georgia signed the association agreement with the European Union, we analyzed future trade relations with Russia and did not rule out the possibility that Russia could make a decision like this," said Zurab Abashidze, the Georgian prime minister's special representative in relations with Russia. "[The decision] will create certain problems in our trade system, but I do not see any tragedy in this," Abashidze said. Georgia is no stranger to Russian trade restrictions: Just last year, Russia finally lifted a ban on imports of Georgian wine, fruit and mineral water that had been in place since 2006. The Russian government published an unsigned resolution on its legal portal Wednesday that would abolish a 20-year-old free-trade regime between the two countries. The document cites a law stipulating that international agreements can be terminated "according to the conditions of the agreement itself and to international legal norms." 01.08.2014. Demand for Georgian wine reduced in the Russian market, wine companies explain this by the end of the sale boom and start of the stable sales. Director of Schuchmann Wines Georgia Nutsa Abramishvili notes that there was a great demand and good payment terms in Russia, the exporters paid in advance and reserved products. "I do not know what will be in the case of Russia in 2015, however, today 40% of our exports go to this market, and in 2015 we plan to reduce its share to 20%, as a result of diversification of other markets. 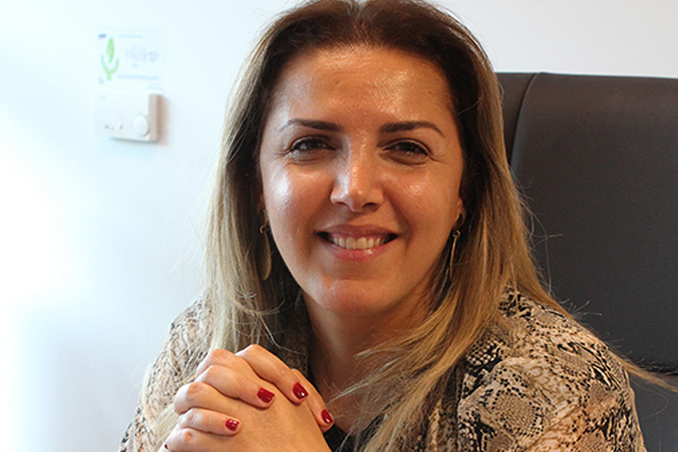 Diversification will occur towards the American, Asian, European and CIS states where we are already present - in about 15 countries - and we plan to expand", - Abramishvili said. Schuchmann Wines Georgia began to export its products to Russia in the fall of last year, in the first half of 2014 the company's total exports have tripled compared with the same period of 2013.